Hotel Nandanik Palace is one of best hotel in this industry in all over dooars including lataguri, gorumara, jaldapara areas. Our hotel have established a reputation for excellence and are acknowledged for offering quality and value. Hotel Nandanik Palace is one of best hotel in this industry in all over dooars including lataguri, gorumara, jaldapara areas. We can arrange dooars tour package for our guests for location of lataguri, jaldapara, gorumara, dooars. These makes us the best hotel in dooars. We offer a large number of best facilities and services to all our valuable guests along with the dooars tour package (for all over dooars, lataguri, gorumara, jaldapara, etc.). If any of our guest feeling seek, we will take care of them and calls doctor on emergency basis if required. Our mission is to deliver 100% guest satisfaction. With the conference hall facility, Hotel Nandanik Palace is idyllic for those looking to plan a business conference or gala events. Our trained staff will give an ear to all your needs and will plan the events meeting all your expectations or even beyond that. Jaldapara Jungle Camp is at Jaldapara Wildlife Sanctuary. Jaldapara Wildlife Sanctuary is a protected park situated at the foothills of Eastern Himalayas in Alipurduar Sub-Division of Jalpaiguri District in West Bengal and on the bank of river Torsa and have an area of 141 sqare km and altitude of 61 m. Jaldapara, the vast grassland with patches of riverine forests was declared a sanctuary in 1941 for protection of the great variety flora and fauna, particularly one-horned rhinos, an animal threatened with extinction. The forest is mainly savannah covered with tall elephant grasses.The main attraction of the sanctuary is Asiatic one-horned rhinoceros. The sanctuary holds the maximum number of rhinos population in India after Kaziranga National Park in Assam. The other animals consist of Royal Bengal Tigers, elephants, deers, sambhar, barking deer, spotted deer and hog deer, wild pig, bisons. Jaldapara is a paradise for bird watchers. It is one of the very few places in India, where the Bengal Florican is sighted. The other birds to be found here are the Crested Eagle, Pallas's Fishing Eagle and shikra, besides Jungle fowl, peafowl, patridges, Bengal Florican and lesser Pied Hornbill. Python, Monitor Lizards, Krates, Cobras, Geckos and about 8 species of fresh water turtles have also found here. Many of the animals are endangered like - asiatic one-horned rhino and elephants in Jaldapara Wildlife Sanctuary. Camp & Infrastructure :Jaladapara Jungle Camp have 02 Attic Cottages, 02 Wooden Cottages, 02 Cottages and 01 Triple Bedded Cottage with attach toilets & baths. Discover nature as you walk with your family ,friends to our Resort explore 5 acres own green Forest situated beside NH .31c and touches with Jaldapara National Park. Jaldapara National Park (formerly Jaldapara Wildlife Sanctuary) is a national park situated at the foothills of Eastern Himalayas in Alipurduar Sub-Division of Jalpaiguri district in West Bengal and on the bank of river Torsa. Jaldapara is situated at an altitude of 61 m. and is spread. Soak in the comforts of Jaldapara hospitality during your stay at the Resort Heaven Inn Jaldapara. Our rooms are equipped with the latest in gadgetry to pamper you. All rooms are very comfortable with 24 hrs room service. A luxury eco-resort by the side of the river Murti. Resort Murti nestled amongst the alluring sylvan splash and surrounded by the youthful exuberance of a strapping Murti River, at the foothills of the endearing Chalsa & the bejeweled Gorumara National Park unfolds itself before our eyes as magic-a bounty of mystery fusing forward a romance Reinvented in Reality. Awaken your senses and get bowled over by the quality of luxury living and dedicated service by experienced hands in Double bed roomed air conditioned Cottages and secluded Family Chalets with individual verandahs for a date with the Jungle and River. 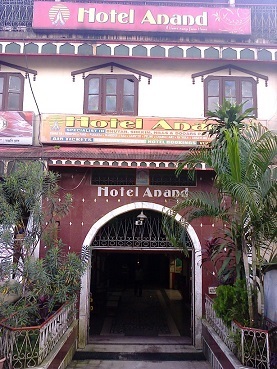 Hotel Anand Located near Bhutan Gate, offers a comfortable stay visiting Jalpaiguri. Hotel Anand has 39 spacious roomswhich includes in-room facilities like a television set with premium TVchannels, desk, an attached bathroom with hot cold running water, laundryservices, makeup mirror, bottled drinking water and wardrobe. With essential amenities and standard service it gives acomfortable stay to every guest. Hotel Anand has a wise front desk and room service staff available which are available. Hotel Anand is in close proximity toSiliguri (163 km), Railway Station (165 km) and Airport (170km). This hotel provides requisite facilities that suffice the requirements of leisure travelers. Our resort is located in the center of all activities. The attraction is not just the wildlife, parks or sanctuary but the remarkably well preserved forested interior with some lovely landscapes. Surrounded by the stretches of undulating span of tea estates and wildlife with the panoramic grandeur of the Himalayas in the background away from the settlement is the resort. This was developed with the intention to promote the enormous tourism resources and to encapsulate the spirit of the region. One can just stroll or drive around or take a hike but never will your eyes feel to rest. If a tourist is a nature lover or an admirer of wild life there cannot be a better place than this for him. Guest can relax and soak up the sun and watch the little ones make new friends at our garden. We can host corporate and social functions plus wedding receptions. Guest will be given or assisted by our own Event Organizer who can help you in the right direction with all details for the given event. The Green Castle Lobby is an exquisite setting for a conference registration, tea breaks, seminar breaks or pre dinner drinks. We also can arrange for all the right equipment to assist with your event. They may include white boards, Computers, LCD TV, screens, PA system etc... We go out of the way to please our guest. Gajagamini Forest Resort is one of the best located resorts in Gorumara National Park. It?s away from the Lataguri market and on the Lataguri ? Chalsa road. Gajagamini Forest Resort is adjacent to Gorumara National Park. Forest makes the natural boundary on its eastern, western and north sides. Main gate of the resort touches the forest entry gate for Car Safari and Chukchuki Watch Tower visit. The resort shares the common electric fencing with the forest department.Inside and outside Gajagamini Forest Resort offers abundant natural beauty. So the taste of the forest can be smelled from its premises. Lataguri village is located outside the Gorumara National Park on National Highway No. 31. Permits for entering Gorumara and Chapramari Wildlife Sanctuary are given from Lataguri. The village also contains a "Nature Interpretation Center", which gives information about the flora and fauna of the area. Celebrated as one of the city's best is, Resort Floret in Jalpaiguri. The hotel is strategically located in Lataguri. This hospitality destination has grown to become the ideal place for travelers and those on business to feel at home when in the city. Many have also reviewed the hotel to be among the sought after Hotels in Jalpaiguri. The hotel functions from - all through the week. Catering to the convenience of its guests, the hotel makes available various payment methods to ease out the payment process . Hotel Chitra in Alipurduar. Restaurants with Address, Contact Number, Photos, Maps. View Hotel Chitra, Alipurduar. Making way for a hearty meal is Hotel Chitra in Alipurduar. This place is synonymous with delicious food that can satiate all food cravings. It is home to some of the most appreciated cuisines. So as to be able to cater to a large number of diners, it occupies a favourable location at Puran Bazar Alipurduar ,. Puran Bazar Alipurduar ,,Alipurduar-736121 is where one can visit the venue. Courtesy to this strategic location, foodies in and around the neighborhood can walk in to this eating house conveniently without facing any hassles related to commuting to this part of the city. It is one of the most sought after Restaurants in Puran Bazar Alipurduar ,. This is a one of the renowned Restaurants in Alipurduar.